On Wednesday I travelled to Paris, to meet the auctioneers who are selling the gun on 19 June, AuctionArt Rémy le Fur & Associés. Rémy le Fur and his colleague Grégoire Veyrès brought out a small white box, opening the lid to display the Lefaucheux revolver resting in tissue paper. The gun was severely corroded, which established that it had probably been buried at some point before the First World War. The wooden part of the grip was missing, presumably because it had long rotted away. The ejector rod, used for extracting cartridges, was bent. Tellingly, the safety trigger was unlocked, suggesting that it may have been fired shortly before it was abandoned. Choosing his words carefully, le Fur says that it is probably the gun that Van Gogh used to kill himself, although it is unlikely we will ever be absolutely certain. The Van Gogh Museum believes “there is a strong possibility that he used it in his suicide attempt”. Le Fur told me the story. 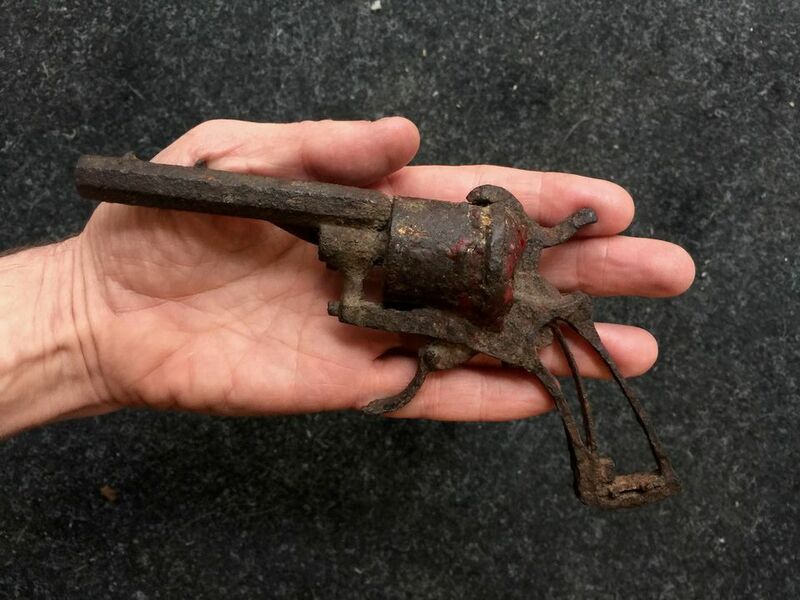 In around 1960 a farmer dug up the gun while ploughing a field on the outskirts of the village of Auvers, which lies north of Paris. He gave the gun to the owners of the café where the artist had lodged in 1890, and it is a daughter who is now selling the weapon. She sees little point in continuing to keep the gun hidden in a box, and hence the sale. But what light does the emergence of the gun shed on the vexed question of whether Van Gogh committed suicide? Two American biographers, Steven Naifeh and Gregory White Smith, argued in 2011 that the artist was murdered by a local lad. This view was also accepted in Julian Schnabel’s new film, At Eternity’s Gate. But virtually all other Van Gogh scholars are convinced that it was suicide. If it had been murder, why would the gun have ended up in the field? The murderer would surely have hidden the weapon properly—perhaps burying it in thick undergrowth or even throwing it into the nearby River Oise, just a few minutes away—rather than simply abandoning it in a field. The fact that the gun was discovered by a farmer just inches below the ground in an open field is surely additional evidence that it was suicide. After pulling the trigger, Van Gogh would have involuntarily dropped the weapon. The Lefaucheux is a small hunting gun, which helps to explain why it failed to kill the artist instantly. Severely wounded in the chest, but still able to walk, Vincent staggered back to the inn where he was lodging, which was just under a kilometre away. He survived for 36 hours, dying in the garret room with his brother Theo at his bedside.